More US troops cannot stabilize the corrupt and despised government in Kabul. On May 11, The New York Times published a poignant article about the ceremonial burial at Arlington National Cemetery of Staff Sergeant Mark De Alencar, the first American to die in combat in Afghanistan in 2017. “Three rifle volleys rang out from a seven-man firing party,” after which a brigadier general presented folded American flags to De Alencar’s widow, Natasha, and other members of his family. “Honestly, I thought the war was over before Mark got sent there,” said Alisha Brown, Mrs. De Alencar’s sister. So too do most Americans, who largely believed President Obama when he announced in 2014 that the US combat mission in Afghanistan had drawn to a close. But that’s not the way it looks to top American military officials, who have presented President Trump with a request for the deployment of some 3,000 to 5,000 more US troops in that country—a request Trump that is likely to approve. Far from withdrawing from Afghanistan, it appears that this country is being drawn ever deeper into a never-ending quagmire. The United States first became involved in Afghanistan in October 2001, following the 9/11 attacks on New York and Washington, DC. Initially, the aim of the US intervention, dubbed Operation Enduring Freedom, was to topple the Taliban regime then in control of the country and to capture the leaders of Al Qaeda, who’d plotted the 9/11 attacks while residing there—an operation that was assumed to require just a few months. But the Taliban and Al Qaeda leadership managed to escape into remote mountain hideouts on the Afghanistan-Pakistan border, from where Taliban militants were able to mount periodic assaults on the US-installed government in Kabul. After the 2003 US invasion of Iraq and the outbreak of a bitter insurgency there, the Bush administration neglected the conflict in Afghanistan and moved the cream of US combat forces to the Iraqi battlefield—a shift that afforded Taliban militants greater opportunity to mount attacks inside Afghanistan. As US commanding officers in Kabul came and went, the Taliban made steady gains in Afghanistan, gaining control over more and more of the countryside. By the time Barack Obama entered the White House in 2009, conditions in Afghanistan had become so bad, his generals insisted, that only a substantial “surge” of US troops (like the one ordered by President Bush in 2007 in Iraq) could salvage the situation. Against the advice of Vice President Joe Biden and others, Obama approved the emergency deployment of an additional 30,000 combat troops in late 2009, claiming they would remain there until the situation had stabilized, and then be withdrawn (this was in addition to an increase of several thousand troops the president had ordered soon after taking the oath of office earlier that year). For a time, the deployment of additional US soldiers (and others contributed by America’s NATO allies) helped to blunt the Taliban attacks and ensure some degree of peace in Kabul and other large cities. Vast resources were also poured into the expansion and professionalization of the Afghan National Army. With the façade of a functioning government being assembled in Kabul, Obama proudly proclaimed that the war was drawing to a close and that American combat troops would be returning home. “Now, thanks to the extraordinary sacrifices of our men and women in uniform, our combat mission in Afghanistan is ending, and the longest war in American history is coming to a responsible conclusion,” he declared on December 28, 2014. But the US troop surge and the all those billions of dollars spent on the expansion of the Afghan army never solved the fundamental source of instability in Afghanistan: the corrupt and illegitimate nature of the central government in Kabul. For all its displays of democracy and modernism, the Afghan government is still largely controlled by competing factions of venial elites, all seeking to extract a healthy share of the aid funds pouring into the country from the United States and other donor nations. Promises by the current president, Ashraf Ghani, to clean up the corruption have mostly gone unfulfilled, and ordinary Afghans feel increasingly estranged from the central government and its representatives in the provinces. In this environment, the Taliban—and now ISIS—have made steady inroads, essentially turning the clock back to 2009, when Obama faced all that pressure to order a troop surge. The April Taliban attack on an army training base, in which 200 recruits were killed, was an ominous sign of deterioration. Just how bad things are at present can be gleaned from the occasional news stories trickling out of Afghanistan—a war zone that has largely disappeared from the front pages of daily newspapers and the nightly TV news roundup. In March, militants claiming to be from ISIS stormed the Afghan army’s main hospital in Kabul and killed over 50 people. The northern city of Kunduz, already occupied twice by the Taliban, is now said to be on the verge of a third attack, with 85 percent of the province already under insurgent control. But the worst indication of the deterioration, by far, was the April 21 attack on an Afghan army training base in Balkh Province in which 200 young recruits—possibly many more—were killed by Taliban gunmen and suicide bombers. From what can be gleaned from the slaughter—the deadliest single attack on the Afghan army since the onset of the war—the attackers, all wearing official army uniforms, had inside help in plotting the attack, epitomizing the decay of government institutions. 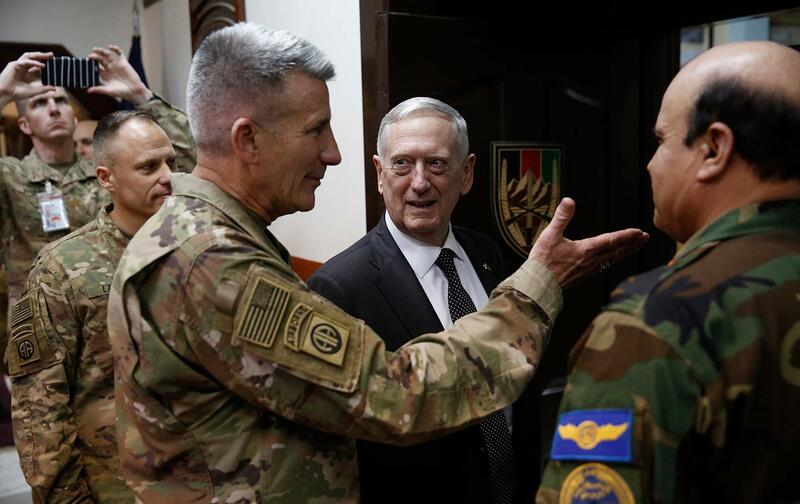 Three days after the Balkh attack, Secretary of Defense James Mattis made a surprise visit to Kabul, where he met with Gen. John Nicholson, commander of the American-led coalition force in Afghanistan, and other senior officers to discuss possible responses to the deteriorating security environment. “We’re under no illusions about the challenges associated with this mission,” Mattis noted while in Kabul. “2017 is going to be another tough year” for Afghan and coalition forces, he added. Secretary Mattis did not reveal his thinking on what is to be done in Afghanistan, but General Nicholson is known to have submitted a request for an additional 3,000 to 5,000 US soldiers, along with a comparable number from members of NATO. According to comments by Pentagon officials, the military is considering what might be called a “surge lite,” entailing a sudden infusion of US and coalition forces to blunt the Taliban offensive and give the Afghan government a bit of breathing room in which to enact reforms and provide better training to its military. President Trump is reportedly aware of these plans, and expected to announce his approval at some point in the next few weeks; he is also likely to ask members of NATO to contribute more troops of their own while attending a NATO security summit in Brussels on May 25. It does not require extensive research on Afghanistan to conclude that a surge lite will no more bring stability to that country than the larger troop deployment approved by President Obama in 2009, or an even greater commitment of American forces. So long as the central government in Kabul is wracked by factional fighting and enfeebled by corruption, it will never command the support of its people and so will be unable to defeat the Taliban (who, along with harsh religious prescriptions, promise clean government). Past US efforts to promote reform in Kabul have all come to naught, and there is no reason to assume that the Trump administration will prove any more successful at this than its predecessors. All we can expect from another US troop buildup, then, is another futile round of fighting and more slain soldiers receiving those ceremonial volleys at Arlington National Ceremony.